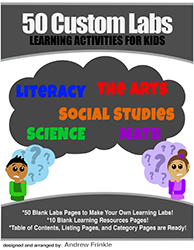 This is a spinoff of the 50 STEM Labs Series. With the success that is having, I'm trying to push the collections of activities into new subjects. Look for more subjects in the future. 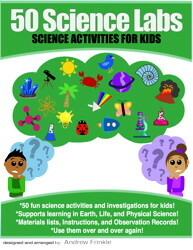 This collection of 50 Science Activities for kids is recommended for grades K to 6. Each one has a snappy title, a brief set of instructions, materials list, and space for observations and notes. These are very adjustable for your classroom, home, or homeschool needs. They support learning in earth science, life science, and physical science with fun, hands-on activities. These are not just simple demonstrations, but explorations into key science concepts, like: Rock Cycle, Water Cycle, States of Matter, Weather, Space, Energy, Electricity, Animals, Plants, Classifying, Heredity, Sounds, and many more! Labs are tagged and sorted into life, earth, and physical science categories so you can search for other similar labs. Types of labs included are: growing crystals, weather calendars, moon calendars, making compost, magnets, food chains, family traits heredity trees, animal projects, reading food nutrition labels, and many more! 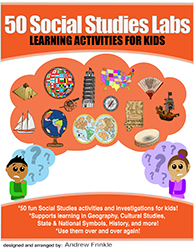 Volume 2 of the series is a collection of 50 Social Studies Activities for kids is recommended for grades K to 6. Each one has a snappy title, a brief set of instructions, materials list, and space for notes. These are very adjustable for your classroom, home, or homeschool needs. They support learning in social studies topics like: geography, economics, history, government, and cultural studies. These are not just simple reports, but a combination of reports, projects, models, map studies, and other types of activities with a lot of possibilities for student creativity. 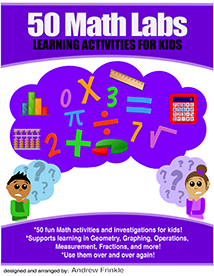 Volume 3 of the series is a collection of 50 Math Activities for kids is recommended for grades K to 6. They support learning in math topics like: geometry, operations, fractions, math skills, graphing, data, and more! These are not just simple reports, but a combination of reports, projects, models, and other types of activities with a lot of possibilities for student creativity. 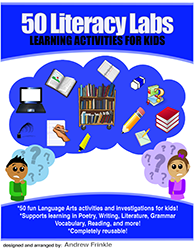 Volume 4 of the series is a collection of 50 Literacy and Language Arts Activities for kids is recommended for grades K to 6. They support learning in language arts topics like: vocabulary, spelling, grammar, writing, poetry, literature, and more! These are not just simple reports, but a combination of reports, projects, models, and other types of activities with a lot of possibilities for student creativity. 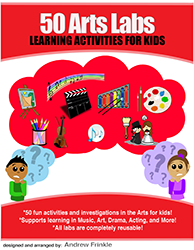 Volume 5 of the series is a collection of 50 Activities in the Arts for kids is recommended for grades K to 6. They support learning in the arts like: music, dance, drama, art, and more! These are not just simple reports, but a combination of reports, projects, models, and other types of activities with a lot of possibilities for student creativity. Volume 6 of the series is a collection of blank forms and pages to help you assemble your own mighty collection of 50 Learning Labs! Customize the content to your own heart's desire! This project was so important to me that I gave it its own site. 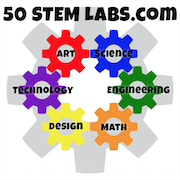 Visit it at www.50stemlabs.com!